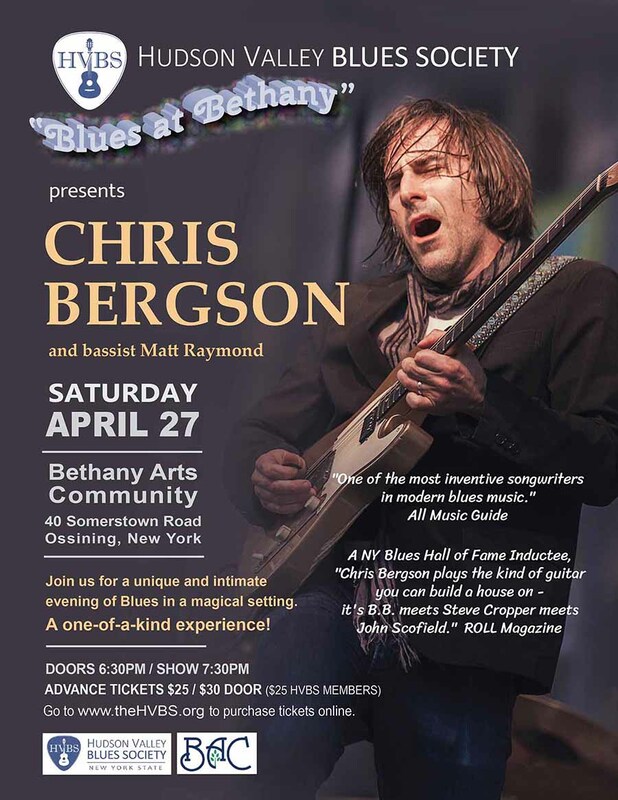 Join us for a unique and intimate evening of Blues music with Chris Bergson and bassist Matt Raymond in the magical setting of Bethany Arts Community! Chris Bergson was inducted into the New York Blues Hall of Fame in February 2015. With MOJO Magazine’s #1 Blues Album of 2008, Fall Changes (recorded at Levon Helm’s studio in Woodstock, NY), #2 Blues Album of 2011, Imitate the Sun, #3 Blues Album of 2014 and #3 Blues Album of 2017, Bitter Midnight, New York guitarist/singer Chris Bergson has established himself as “one of the most inventive songwriter sin modern blues music.” (All Music Guide.) Chris Bergson has performed with Levon Helm, Hubert Sumlin, Norah Jones, John Hammond as well as jazz legends Annie Ross and drummer Al Foster (Miles Davis) and opened for B.B. King, Etta James and Bettye LaVette, to name just a few. Bassist Matt Raymond has been a member of the New York and New Jersey Blues, Roots and Jazz music scene for over twenty years. He has performed with Levon Helm, Bettye LaVette, Hubert Sumlin, Paul Oscher, Bruce Katz, Jaimoe of the Allman Brothers, and Bob Margolin to name a few of the dozens of acts he has played with nationally and internationally. Most recently, Matt was a longstanding member of the Chris O’Leary Band. He is also the house bassist at Grammy nominated Dave Gross’ Fat Rabbit studios.